Past Due Records is proud to officially reissue the 9th Creation’s essential full lengths and singles, carefully remastered and all in their original artworks. After 9th Creation’s departure from Prelude (due to a lack of promotional support). J.D. Burrise brought the band back in the studio for a self produced and released album under his own outlet Burrise Way Productions. 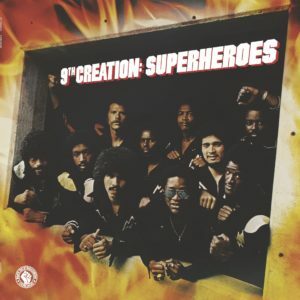 “Superheroes” shows the band reaching maturity in their heavy soul, funk and disco sounds. A monster album reissued for the first time!